It was a dark and stormy Halloween night, and the trick-or-treaters stopped their visits early because it was about to rain. At first I was pleased that I was going to have all those bite-sized Snickers and Three Musketeer bars to myself. Then, after a particularly loud clap of thunder, my eighty-pound Labrador retriever jumped into my lap, causing me to scream in agony. She jumped and spun around to stare at me which meant her huge paws dug down deeper into my crotch. Before the dog could move, another clap of thunder shook the house. Whimpering she shuffled her feet in the exact same plan and spun around to gawk out the window. She whipped her head when I yelled at her again. Her large head crashed into my nose. Anytime I had ever been hit in the nose, my eyes filled with tears. This was especially embarrassing because the last thing a little boy wanted to do in front of the other guys was cry. My dog forgot about the storm when she saw the tears roll down my cheeks and leaned forward to lick them away. Crack! Another thunder eruption made her lunge forward, bumping into my nose again. She backed up, her paws unfortunately pushed down into my crotch another time. I did not know which hurt more—my nose or my crotch. I started whimpering which, I think, confused my dog because I sounded just like her. When she got confused she lifted her left paw to high five me. It was a trick I taught her when she was a puppy, and whenever she began to feel unloved she high fived me for reassurance. I was so obsessed with not crying that I did not see her big paw coming right at my nose. The fourth round of thunder was too much. She lost control of her bladder and wet herself. Because she sat on my lap she wet me too. Blubbering, I tried to push her away but she pushed back and put her paw up for another high five. I hadn’t been this frustrated since I found out I couldn’t climb out of the crib. Or maybe I just dreamed I wasn’t able to get out of the crib; anyway, I knew I was frustrated and started stomping my feet. What I didn’t realize was that the movement of my legs under the dog scared her even more. She peed on me again. I thought she wouldn’t have had any more urine after the first gusher. I was wrong. Neither of us needed a fifth clap of thunder, but it burst out on the scene nevertheless. I would have shrieked again when her paws dug in deeper, but I was distracted by the sudden warm droppings on my pants. Oh crap. When the dog started howling, I thought my eardrums were about to burst. Right at that moment my wife walked into the room. 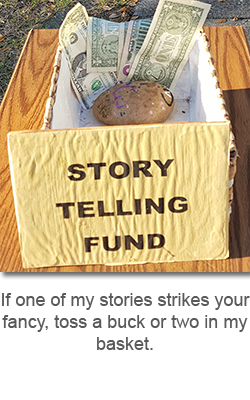 This entry was posted in Stories and tagged family, Halloween, short story, storytelling on October 23, 2018 by jerrycowling. Oh my gosh!!! That is a new story from you. Hilarious. Laughing out loud, literally.